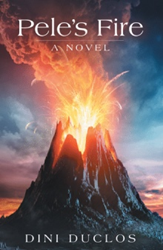 Taking place on the Big Island of Hawaii near the city of Kona, Dini Duclos’ new novel “Pele’s Fire: A Novel” (published by Archway Publishing) follows two girls on an adventure catalyzed by finding an odd rock. The escapades begin with Sheila and Lani, high school seniors, walking along a sea wall on their way home from school. Noticing an unusual rock, Sheila picks it up and feels a strange attachment to it. After asking her biology teacher about it the next day, Sheila cannot help but wonder if the rock has magical powers. The story her mother retells about a mysterious rock sighting years ago in Kona deepens Sheila’s conviction. As they discover more about the rock, Sheila and Lani also realize the danger it puts them in. Dini Duclos is a master scuba diver, the highest non-professional skill level of the Professional Association of Diving Instructors. Her writing is inspired by her years of diving and experiencing the secret beauty of the underwater world. She dives in Hawaii often and has fallen in love with Kona on the Big Island. Now retired, Duclos lives in Federal Way, Washington, where she serves on the city council.